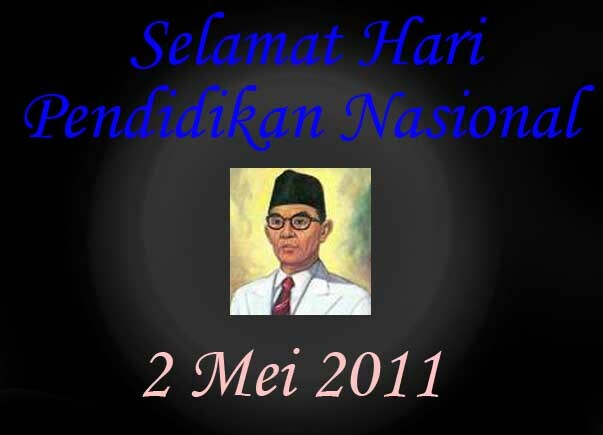 National Education Day is a day where the educational establishment in Indonensia. May 2, used as a day of education Nasonal birthday coincided with one of our education leaders of Ki Hajar Dewantara with the original name: Raden Mas Soewardi.Commenting on a bit about the struggle to advance education in the Earth Indonesia, he had established one of the park on July 3, 1922 students to popular schools in Yogyakarta. Then he also had written numerous articles that point to protest the policies of the colonizers (The Netherlands), which sometimes kill and inhibit the growth and development of education in Indonesia. Through the Presidential Decree No. 305 Year 1959, dated 28 November 1959 Ki Hajar Dewantara been named as one of the heroes of the National Movement. Even more encouraging himself is considered the "Father of Education to all Indonesian people, respect is evident with the set May 2 as National Education Day. To realize and develop the education sector in Indonesia which is diusahaknnya in colonization of the Dutch colonists, he wore semoboyan "Tut Wuri Handayani" slogan is derived from the original phrase "Ing Ngarsa Sung Tulada, Ing Madya Mangun Karsa". This slogan is still used in our educational world up to this reform era.Even with the slogan that has been slightly changed the color of our education in Indonesia today. 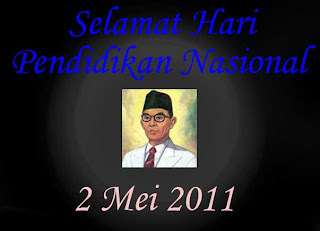 National Education Day Date May 2, 2011 has important meaning in the Indonesian national education arena. namely human memartabatkan Indonesia in the international arena. So also just for students of senior high schools, vocational school, junior high schools and one after another student in primary schools which will implement the national exam and UASBN. However, education in this country has not moved rapidly moving towards a satisfactory quality. When you want to look back, when yesterday after carrying out the National Examination in math lessons for high school students / MA / SMK, they face many had concerns about the results obtained in the examinations. Must be like if that could be implemented by instuisi our education? Is this a learning process that one or less stimulation of the students in following the process of education every day so that said failure in education? Back again on the day of National Education, that the problems of lack of enthusiasm of the students must be addressed seriously by all parties, both parents of students, technicians and government education. It is better to sit in one table to find appropriate solutions in promoting national education. If the invite directly to discuss about it, better and each has a sense of responsibility to meet the challenges this nation forward in building a more advanced education in Indonesia, dignified and equal with other nations in science. 0 Response to "National Education Day"